Out of stock until Spring. 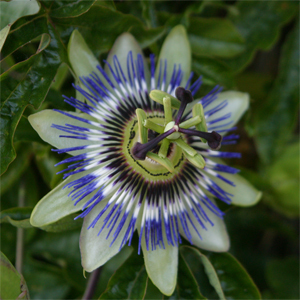 Blue Passion flower. A vigorous climber with rich green leaves and bowl-shaped white flowers with blue tips in summer followed by orange-yellow fruit. Max Height 10m. Flowers June to August. Fruits August. Partial shade. Frost hardy. Harmful if eaten.